PPI stands for Printed Postage Impression, and refers to labels that can be used on packages and letters sent via The Royal Mail. This type of label, as opposed to the standard stamp or franking method, is useful when sending large quantities of mail and can be simply and conveniently downloaded and printed in the office or home. Customers can create their own specially designed labels that are company, individual or industry specific and can tie in with existing branding. It is, however, necessary to obtain a license for a PPI label to be able to use them. This can obtained directly from The Royal Mail either in person, online or over the phone with their sales team. PPI labels can also be used for both national and international postage destinations, which means you can use them across your whole business. It is also possible to choose between a variety of different delivery options, including standard first and second class, next day delivery and signed for. What are PPI Labels Used for? PPI labels are valuable for smaller companies such as small traders, businesses and online companies, as they can be printed on demand and come in a variety of shapes and sizes. This versatility means that labels can be printed for any type of packages, from the very small to the very large, and enables traders to have a greater control on the look and feel of the product being shipped. PPI labels also add a touch of professionalism and consideration to a package that might otherwise look messy covered with stamps. Once you have received your PPI license from the Royal Mail, you can download a number of different designs from their website and then have them printed anywhere. This can save time, money and hassle in the long run for you and your employees. Labelled letters and packages can then be dropped off at your local Post Office or, for an additional cost, picked up from your company’s location. PPI labels were first introduced The Royal Mail to bridge the gap between larger companies, who might prefer to use a franking machine for their business needs, and smaller and online traders who might use home, smaller or much more temporary office and working space. The postal service also realised that as the majority of these types of traders own a home computer and printer, they could offer a service that would be both bespoke and on demand, providing the most convenient approach for many individuals. 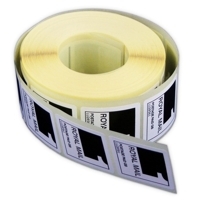 The great advantage of using PPI labels is that they can be printed separately or in bulk. It is worth remembering, especially for online traders, that seller feedback, or rather seller disputes, most commonly arise over shipping time and quality and protection offered by packaging. PPI ensures that traders can operate in the most timely and efficient way possible. Label designs that have been created using online software is fast and efficient and is the best way to produce PPI labels. Another strong advantage is the fact that the Royal Mail offer several discounts on services that use PPI, and this can make all the difference for a smaller or independent trader who can then pass this discount on to their customers. Alongside this, the Royal Mail creates an account for you when you register and this can be paid on your Royal Mail credit account with up to 30 days leeway, meaning you do not have to pay upfront every time you send. This can help significantly with budgeting and cash flow. The Royal Mail accept numerous different payment methods for PPI, and this means that you can tailor your mailing system to a payment method that suits your individual company, while still benefiting from the same service that regular Royal Mail users are offered at costs that, generally, beat all courier alternatives. There are certain disadvantages that come with using PPI labels. Although the process can be done at home, for larger companies the cost of the service is only fractionally cheaper than using a franking machine. Another factor is the status of your business, which may affect smaller or more sporadic traders. You will need to be registered for over three months as a company and also, and this is key, spend over £100 a week in postage costs. This option will not suit anyone who trades in their spare time or operates a small business venture with low outgoing postage needs. Sticky Labels offer a tailored design and print service that can accommodate all your particular PPI label needs. You can play with font and colour on our easy to use a template and get advice from the experts! Our label printing is stress-free with many different order and payment options, free UK delivery and our labels are dispatched within three days.